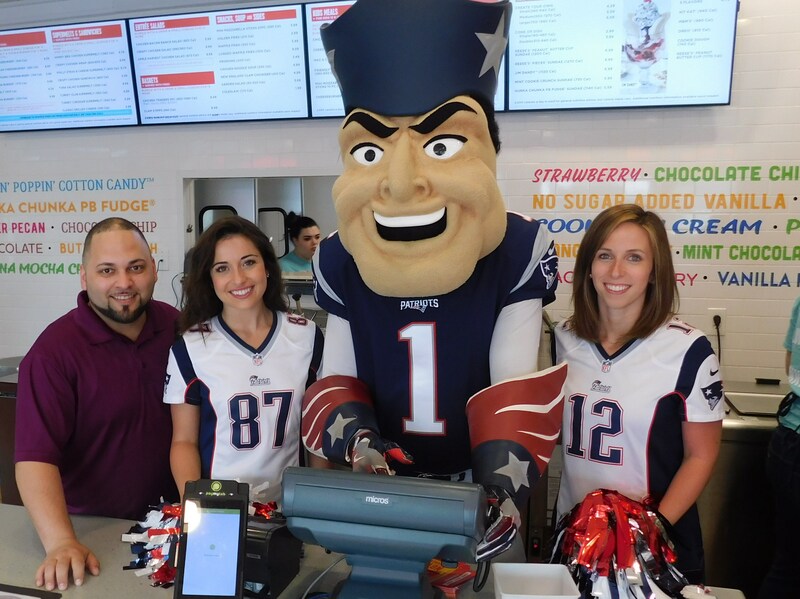 Photo by Jacqueline Bennett Store manager Hector is joined June 18, 2018 by New England Patriots cheerleaders Isabella and Courtney, as well as, team mascot Pat Patriot, welcoming customers to the Express Service shop on 240 Buckland Street in Manchester, Connecticut. 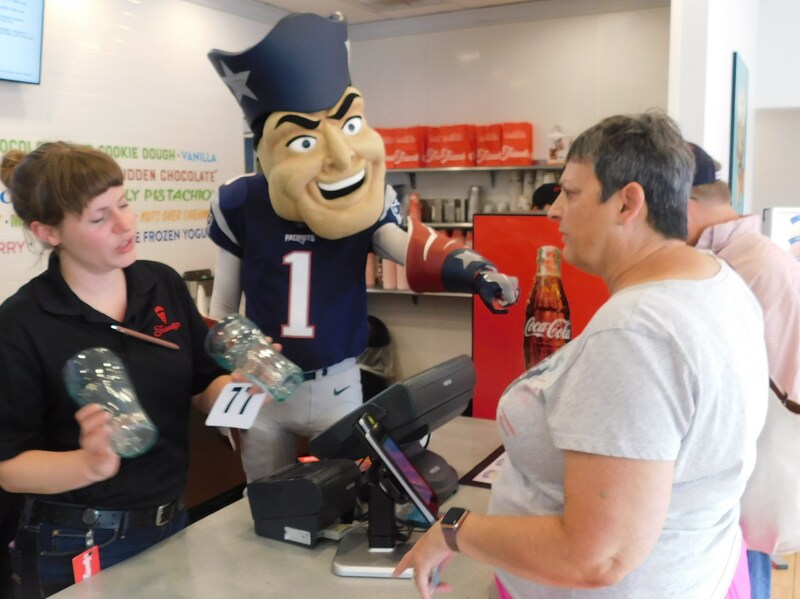 New England Patriots cheerleaders and team mascot Pat Patriot were on hand Monday, June 18, to welcome customers to the newly converted Express Service Friendly’s on 240 Buckland Street in Manchester, Connecticut. “It’s going well, ” noted store manager, Hector. For those of us who grew up with wholesome Friendly’s ice cream and sandwich shops throughout New England, where we went to enjoy burger melts on grilled bread, crispy French Fries and a Fribble – meeting up with classmates there on Friday nights, standing in line with family for a booth, or counter seats, where waiters and waitresses then took our orders – is a part of our cultural history. Remember waiters clad in sharply pressed white uniforms, and waitresses wearing gray dresses with delicate white collars and white aprons with ruffles? Friendly’s restaurants – the quaint looking shops themselves and signature menu fare – became a piece of the Americana patchwork, a New England icon. Some long-time staffers have been kept on here. Three of those women, I was told, served tables a combined 46 years at this particular location. On Monday, one of those women was saying “hello” to customers at the door and explaining the new set-up. Expect to also see new hires on the scene. On Monday, some area schools had early dismissal due to record heat and humidity, 90 plus degrees. To cope with the heat, what could taste better than ice cream? My Friendly’s preferences are New England Clam Chowder and Vienna Mocha Chunk ice cream. 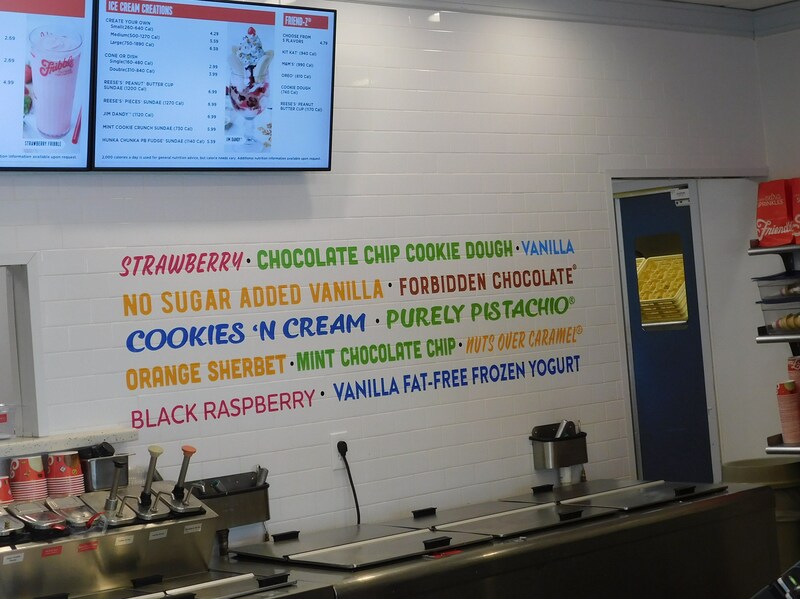 How about you – do you have Friendly’s favorites? If so, “express” yourself.